We finally had a housewarming for Katherine and Trenna (who moved in in March and July respectively), and a going away party for Trenna who flies back to Canada in November. It was a funky little shindig, and to help feed the masses i baked these cute little chocolate bites. In the end i made about 50-60 and there were only about 12 left the next morning, so i guess they were ok! 1. Preheat oven to 175 degrees C (350 F). Line muffin tins with cases. 2. Sift together the flour, baking powder, baking soda, cocoa and salt. Set aside. 3. In a large bowl, cream the butter and sugar until light and fluffy. Add the eggs one at a time, beating well with each addition. Stir in the vanilla. 4. Add the flour mixture alternately with the milk and beat well. 5. Fill the muffin tins 3/4 full. Bake for 10-15 minutes or until a skewer comes out clean. 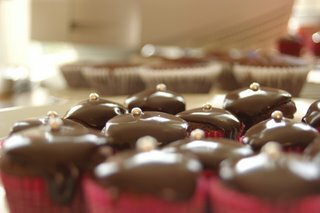 Leave to cool in tins for at least 10 minutes, then pour over Chocolate Ganache when cupcakes are completely cool. 1. Bring cream to boil in a medium saucepan. 3. Leave at room temperature until of a good pouring consistency. You are welcome to use any of the recipes you find here. 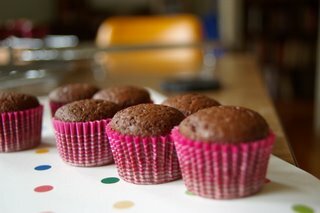 If you post the recipe on another site, I would appreciate it if you could put a link back to Cupcake Frenzy. All measurements are metric. Tablespoon measures etc. are Australian sizes, e.g. 1 tablespoon = 15ml. I can't think of anything else, any questions please let me know!